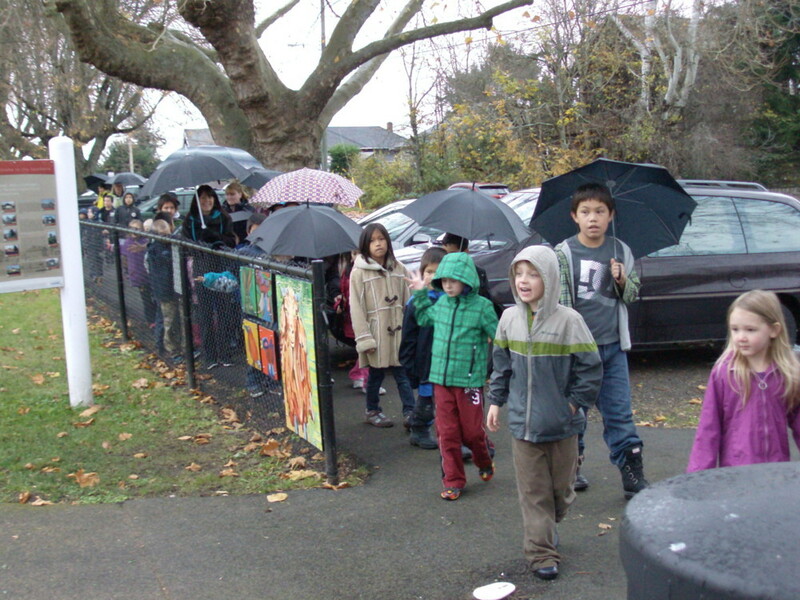 It may have been gray and overcast, but nothing could dampen the spirits of the 200 Bayview Elementary school children who crowded into Deverill Square Park last Friday morning to celebrate the grand opening of their very own “Little Hummingbird Project.” Members of the South End Community Association were there to cheer them, feed them, and thanks to our venerable old Tea Wagon, provide the many parents, teachers and attending Mayor and council members with a much appreciated hot cup of tea. 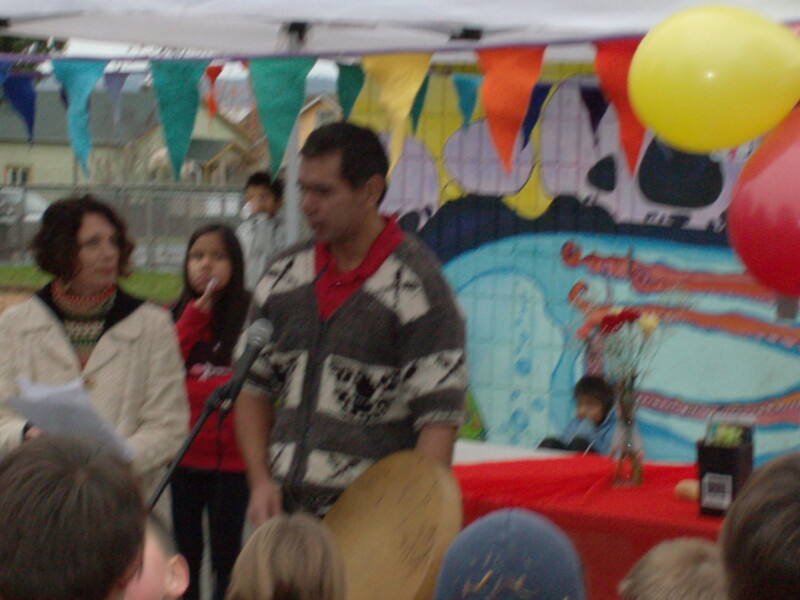 We were all there to celebrate the completion of a rather special art project that originates in the story of “The Little Hummingbird” by Michael Yahtulanaas, a first nation’s artist who has interpreted and illustrated an old indigenous legend from South America. Bayview Elementary has adopted the story as a simple yet moving parable about how great things can be achieved, one small step at a time. It’s been a rich process in many ways. 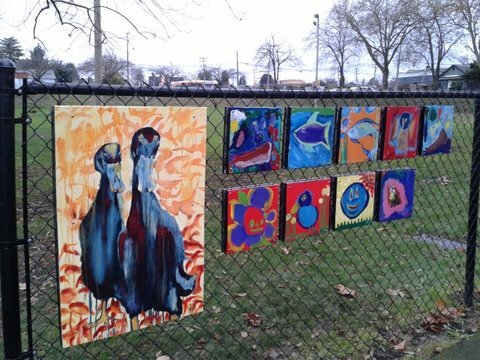 The tangible outcome has been over 200 brightly painted art panels that have been hung in clusters along the surrounding fence line of the park. The images are inspired by the story and all the animals and birds that helped the little hummingbird put out a great forest fire, one drop at a time! The enthusiasm and pride expressed by the children was quite wonderful to behold. 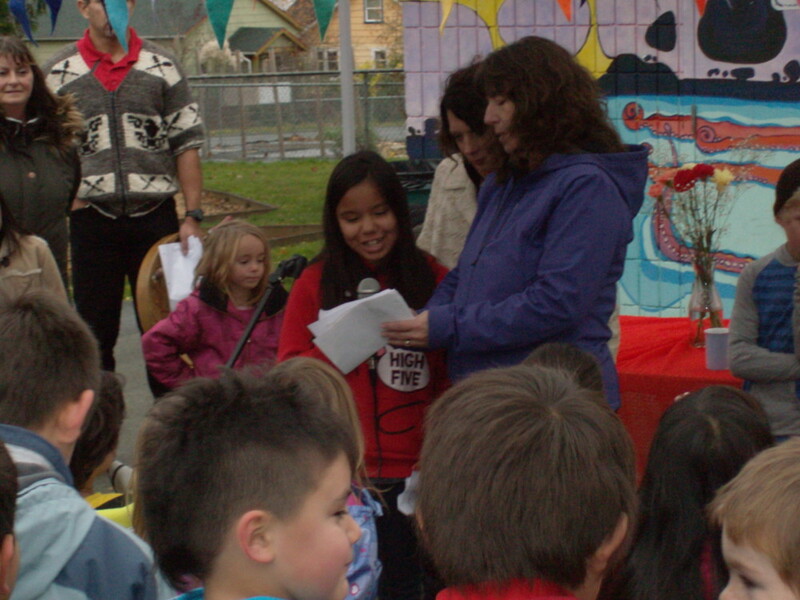 The project has been a marvelous way to bring the story of the little hummingbird to life and show the children that together, they really can make a big difference in their community. 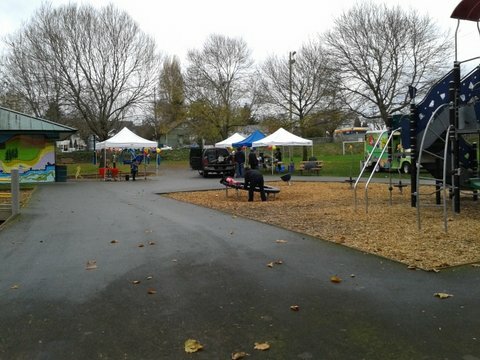 The project has been funded by the City Of Nanaimo, Parks Recreation and Culture, Volunteers in the Park Program and is a terrific example of how public art projects can enrich and contribute to the well being of a neighbourhood. 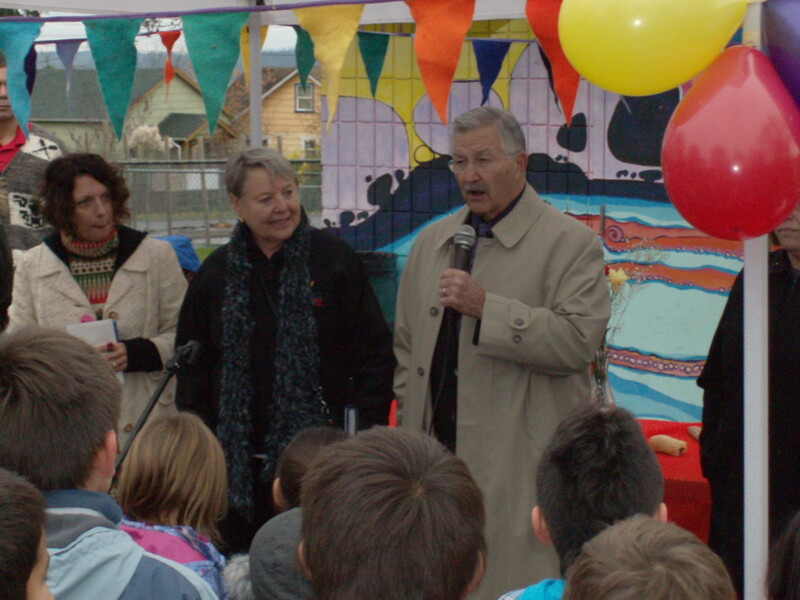 Councilor Diane Brennan really struck a chord with me when, as she was congratulating all the children on their wonderful art work, she told them that she thought they lived in a great neighbourhood full of adults who care about them and appreciate them. It was a lovely sentiment that perfectly captured the essence of the day. 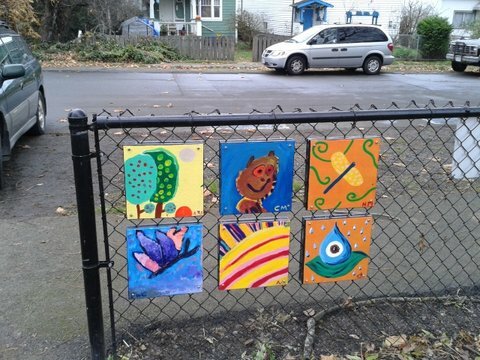 THE HUMMINGBIRD PROJECT – a Public Art Project at Deverill Square – Friday November 15th from 11AM to 100 PM. 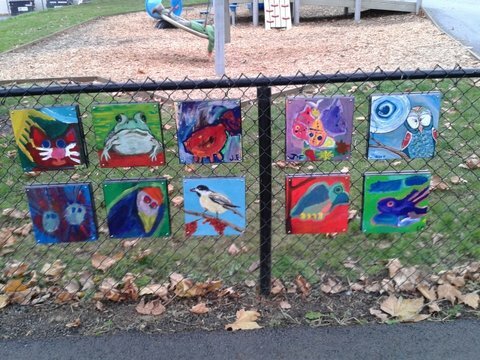 View 250 Paintings Installed on the Fencelines Around the Park. Hot Dogs and Treats for All! Funded by the City of Naniamo through VIP Public Art. 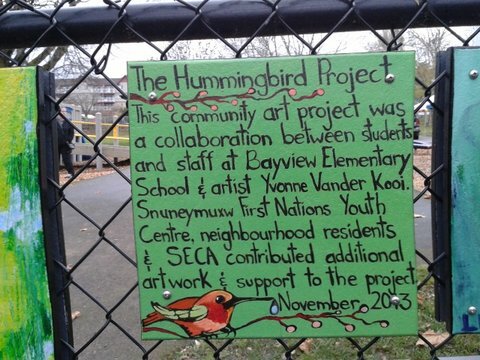 Hummingbird Project – Yvonne – near end of project, very successful. There were field trips and talks about public art. The children were excited by the project and some 250 paintings were done. Pictures hanging to be focused around Haliburton entrance of Deverill Park. This will be Friday Nov. 15 between 11AM and 100PM. People needed to help set up about 10AM A barbeque also needed. 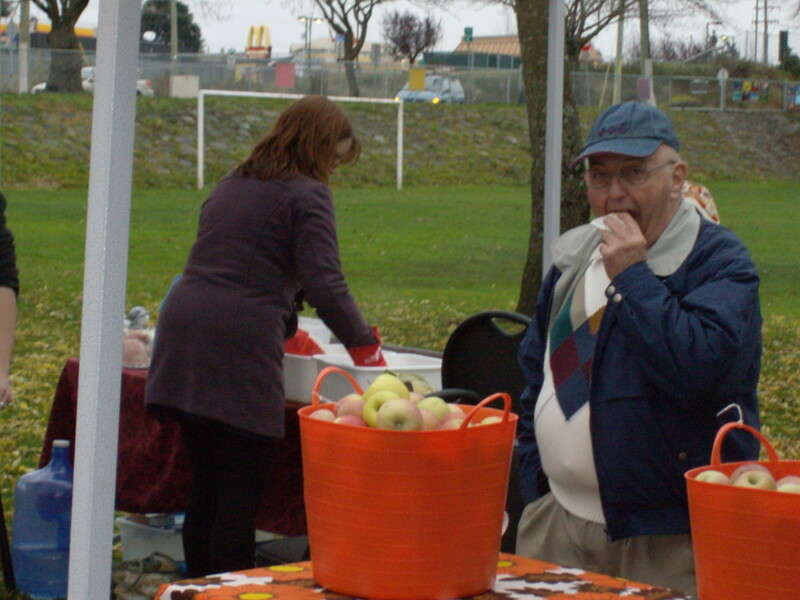 Senior’s Development – Julie Winkel – possible low-cost independent living units for seniors in the neighborhood. 20-30 units. Includes pets. Suggestions from SECA members included need for gardening spaces and communal areas inside. Sensory Garden – Chris – map and photo display of proposed garden in Deverill Park. City wants to change location as not enough room by trees. Suggested areas include by the entrance or a portion of the soccer pitch by Irwin Street. The field is not regulation size and is only used for practice or pick-up games, so taking a bit out of it should not interfere. SECA members prefer this location. However Snuneymuxw First Nations have long used the field and nothing will be done without their agreement. 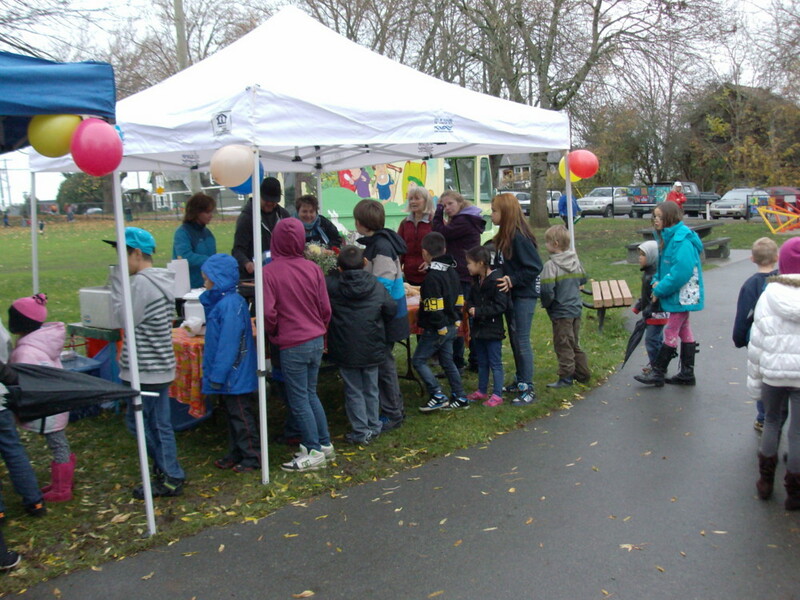 Waterfront Planning – Douglas and Chris will be going to the charette Thursday and Friday. Pat pointed out the lack of women on the Planning Committee and noted the gender parity at the charette. Beer and Burger – possibly January and at Alice’s or Days Inn? Rowe House – Sydney and Lorraine went to discuss a Good Neighbor Agreement with Steve Arnett. Meeting went well, and Rowe house will send rep to SECA meetings. House is filling very slowly. 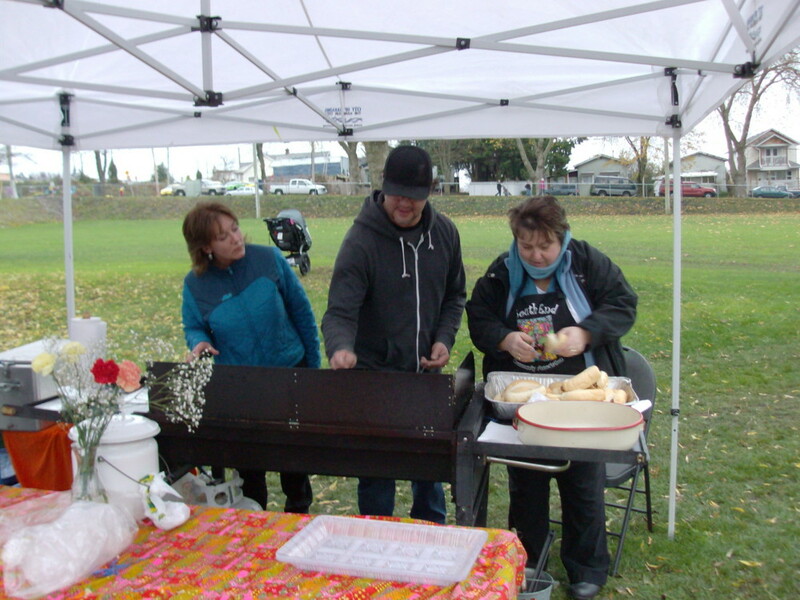 AGM – December 4 at 600 PM, bring finger food please!